I hope you all had an incredible weekend. I know they sure come and go so fast these days. Even faster the closer we get to the holiday season. Hubs and I spent the day yesterday cleaning the roof, gutters, raking a million leaves and taking down our summer patio furniture. I am obsessed with the leaf blower and think I blew every leaf near and far only to have them all return by evening as California was oh-so windy yesterday. Are you having cooler weather yet? Which boots are you loving? Would you wear a hat all day? 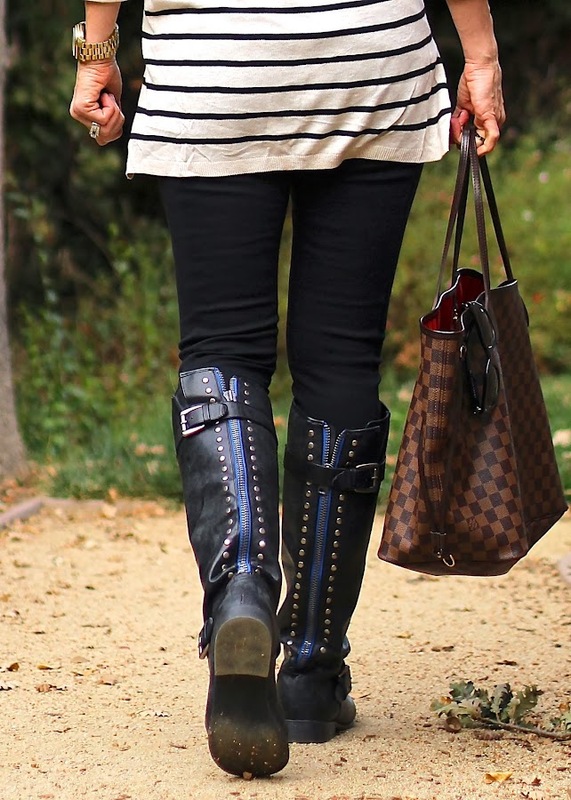 I love the detailing on those boots! Hi Barbie, love the outfit! Great combo, adorable hat and boots! I love that handbag! It is so perfect! Beautiful outfit! I can't believe that hat is from Target!? It's so gorgeous. Those stripes and that necklace too – love love love. Love the stripes paired with this hat! Gorgeous :) Cute blog, I'm following along. Can't wait to see more. Oh my gosh I love that hat! Super cute for Fall! I might have to run and grab it!!! :) Thanks for the share! Target for the win! That floppy hat is adorable on you and I loooove the studded detailing on the boots! Those boots are ridiculously amazing and I'm quite jealous! ;) I love the detailing on the back... and your floppy hat is just so chic. I just love this look head to toe!! I love how Doable this look it! its cute yet super easy and looks really comfy! !